The stadium area, 13 El-Hana St. The EGPI Pharmaceutical Industry is committed to give relentless efforts to abide by the ethics and principles and comply with the rules and regulations of medicines manufacturing, administration in all aspects, marketing and production of quality medication by utilization of technological advancement and new inventions with the great objective of welfare of human beings in the therapeutic field. The management of the Company has been able to continue smooth production process by successful dealing of the various significant issues such as efficient management of capital, due settlement of the institutional investment, proper sourcing and utilization and storing of required raw materials. 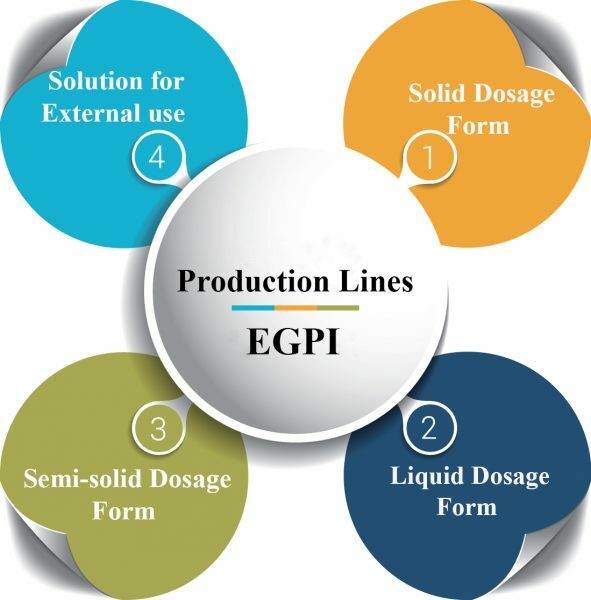 In the recent years new sophisticated medicine have been added with the product portfolio of the EGPI production capacity increased and marketing territory of the ُEGPI in both local and abroad expanded This is the mark of our gradual growth and preserving the interest of the investors through in accomplishment of our strategic objective. In order to keep on our development and long term strategic goal, the Company is vigilant in respect of research and development, enhancement of production capacity, quality improvement of factory and registration of more medicine in the global market. Keeping in view of growing market demand, medicine production capacity had been enhanced, some sophisticated modern machineries with required technologies had been added and to ensure the quality of production, experienced and dedicated personnel have been recruited. With more than 25 years of experience in EGYPT generic pharmaceutical market, we provide unparalleled experience to our partners. Our partners benefit from our well-established reputation for quality, compliance and customer service. Strategic partnerships are an integral component of the company’s growth strategy. We are focused on developing products. We continue to build and foster strategic business alliances with major pharmaceutical companies, specialty drug delivery companies and other product and service providers. Achieving a successful partnership can present a number of challenges for Egyptian Group for Pharmaceutical industries. However, Par Pharmaceutical’s nimble organizational structure promotes decisive action and first-to-market status, helping to make partnerships run more smoothly. El mostakbal square, El-shabab St , El Obour City. EGPI is a Pharmaceutical Manufacturing Company founded in 2006 (as a brother company of EGD= Egyptian Group for Drug Trading company which founded in1994 as a marketing company) to formulate, register and produce, high quality pharmaceutical products, initially focusing on the Egyptian market, but with a vision of expanding in Middle East.